Cutting-edge, patented technology allows the HurryCane, the #1 selling cane in America, to feel like a seamless extension of the body. The HurryCane is unrivaled thanks to industry-leading innovations. A SteadiGrip base simulates your foot’s natural stabilizing points, increasing traction and improving balance. To further maximize stabilization, the HurryCane automatically flexes on inclines, uneven ground, and fluctuating terrain both inside and outdoors. Effortlessly fold the HurryCane to one-third its normal size for compact storing whenever needed, and easily flip back out for continued use. To find the perfect fit that will provide lasting comfort, adjust the cane height between 30.5" to 37.5" by simply pushing the button located on the handle. Feel confident using the durable HurryCane to ensure the next steps you take are safe. 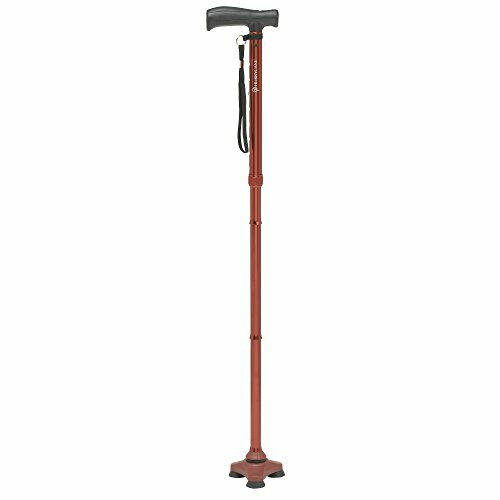 The HurryCane is tested to support up to 350 pounds and is available in black, blue, purple, and red finishes. Customize the fit of the HurryCane by adjusting the handle height setting between 30.5" and 37.5"